Big, but how big? 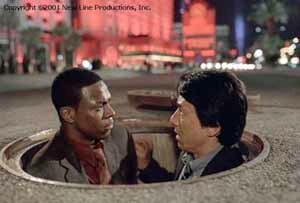 The first Rush Hour film opened in September 1998 to $33 million. It had a surprising $10 million Friday, and managed to increase on its Friday gross on the Saturday following, indicating its fabulous word-of-mouth. People assumed the chop suey comedy would not work, but it did, and worked big. Three years, less a month, later can the dynamic duo do it again? Why not? Rush Hour 2 will be big; the real question is, how big? Considering the big opening-weekend gross, both of the original films stars did not run out and do hastily thrown together films. Jackie, of course, did Shanghai Noon, which opened to $19.65 million over the Memorial Day weekend of 2000. Chris Tucker, on the other hand, really didn't do much, other than circle a variety of projects. In fact, Tucker didn't do anything, and somehow is now getting a reported $20 million dollars to make Rush Hour 2. In an inspired casting move, the boys are trying to crack a counterfeiting ring and are pitted against Ziyi Zhang, of Crouching Tiger fame. Will Jackie Chan do a lot of crazy stunt stuff and fight bad guys? Will Chris Tucker crack wise? Obviously. Brett Ratner is back in the directing chair, and in a truly bizarre choice of writers, Jeff Nathanson, who wrote the screenplay for the sequel disaster Speed 2: Please Don't Make Me Watch It Again, is tapped for screenplay duties. The shock that followed the success of 1998's Rush Hour was nothing compared to what would follow the release of its sequel. The first movie's $33 million opening and wacky mismatched partners set it up as a Lethal Weapon for the next generation, right? Well, the Lethal Weapon series never did this. Just a week after Planet of the Apes had set a new weekend record, this upstart film came within inches of making it a one-week reign. The $67.41 million it earned was all the more significant since it appeared in a small-by-blockbuster standards 3,118 venues, almost 400 less than Apes. While that film's weekend was more or less expected, the explosion of Rush Hour 2 was the clearest evidence of a fundamental step upwards in the box-office paradigm.